This building is said to have been built by the regent Toyotomi Hideyoshi in 1589. It is said that when Hideyoshi’s mother fell ill, Hideyoshi prayed to Inari Okami, pledging to donate 10,000 goku (units of rice, the currency of that time) if she recovered. 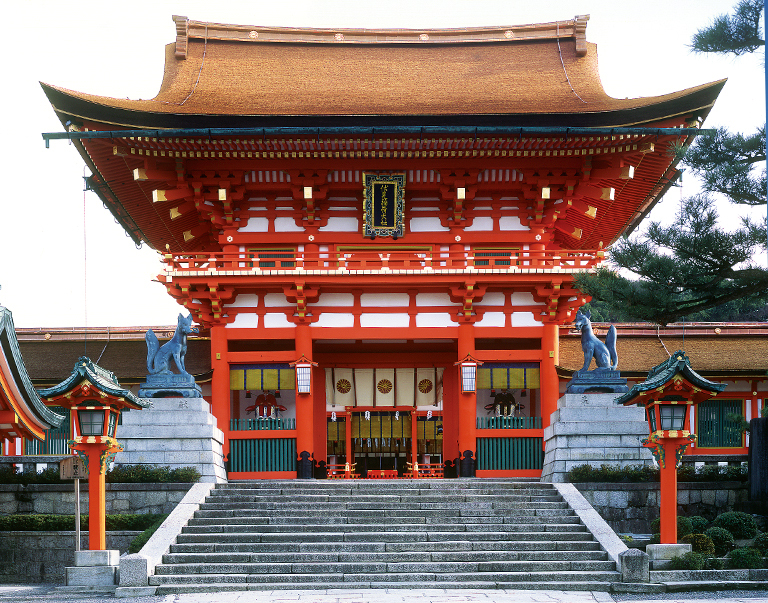 His wish was granted and the Main Gate was built with Hideyoshi’s donation. There was some doubt about the truth of this story, as there were many inconsistencies between writings about the event and the building itself. However, when the Main Gate was dismantled for repair, a text written in sumi ink was found. The text dates back to the same year as Hideyoshi’s pledge (1589), confirming that his pledge was real. No information or images from this website may be reused or reproduced without authorization.